Cops have it rough. Law enforcement agents of every kind must find a delicate balance between dealing with the bad guys and self restraint. One cop I used to know (a black belt) once told me that many years of martial arts training does not always compensate for what goes down in just one day on a New York street. Chuck Norris, stationed at a US Air Force base in Korea as a military cop in the early 60s, dropped a rather large drunken Sergeant in a barroom melee with a single front snap kick to the groin. Crime really doesn't pay. A modified version of self defense is taught at law enforcement training facilities, but with the provision that the would be defendant can walk into a jail cell in one piece. A police baton was re-designed to resemble the tonfa (an Okinawan rice mill lever) - a nightstick with an appendant short handle attached perpendicular to the main body of the weapon. But it was abandoned when cops found it so unwieldy to use. Cops must feel like they have their hands tied when dealing with dangerous types. When subduing a criminal, for example, choke holds are strictly prohibited, and obviously for good reason. Of course, this all runs counter to what the martial arts were originally designed for. The good guys are expected to play by modern rules. Interesting. 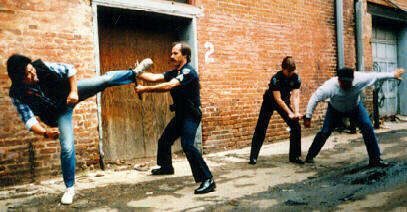 My first dojo was run by a pair of police officers, and their training always ran to the highly practical. Sensei advocated quite strongly that even in an altercation one should use the minimum necessary force to stay out of danger - even for the non-police. Unsurprisingly he was a fan of control holds, pressure points, and crippling, but non-lethal strikes (breaking knees, etc. )His point being that even for your average person on the street, responding with full-out force can end up with you in trouble rather than your attacker. Thanks PB. Cops are subjected to things like lawsuits, especially following a violent encounter with a suspect. Upholding the law while enforcing the law can be a tall order. My deepest respect goes out to those men and women who rush out into places where most of us would rather run away from there. Nice post. Which kind of follows your "Duel" post. Rules have changed. Priorities and values have changed. And here, we see the other side of the coin. Yes, life is more valued than it was. But it also applies to criminals and law officers who have to enforce the law. No system is perfect, I guess. I have friends that are officers. They often tell me that what you see on the news is about 5% of what's really going on. Maybe we should try to remember that, the next time we get a ticket for speed or running a light or whatnot. They're simply doing their jobs. At least in a duel, there's no "double standard". But you're right, everything's changed, mostly for the better though. I have a lot of respect for what police officers deal with on a daily basis. I don't envy them one bit. It must be very hard for them; especially when they're dealing with child molesters, etc. Now you're hitting a topic that is VERY close to my heart. Being a former police officer, I can tell you that when trying to apprehend ANY suspect, you WILL be talking to his/her lawyer if you have to get physical at all. Which means, yes, even somebody that "comes along quietly" will try and sue you for putting the cuffs on too tight. Using restraint whenever you walk in on somebody beating the crap out of their kid is hard indeed. It takes enormous ammounts of self control not to beat the "ever loving sh*t" (forgive me, I am from the south and we do talk that way o.~) out of them. Choke holds ARE prohibited, unless you can prove the use of force rules. Meaning that the suspect would have or was trying to kill you to get away. That can be really hard to prove, unless, they had a weapon of some sort. At the South Carolina Academy of Criminal Justice, we are taught some, but not much in the way of self defense. We use PPCT, established by Bruce and Sandy Siddle. It uses a LOT of pressure points and pain compliance theory. I went a step further in my training and became a certified instructor. Mainly so that I could get a couple of paid weeks off to go and be a guest instructor at the academy :) Bruce Hancock is the main self defense instructor there at the academy and has, possibly, the fastest hands I have ever seen. He is also an awesome instructor and a former officer himself. I would have to say that if the youth of our nation were to be involved in the martial arts in more than just a jackie chan or bruce lee movie capacity, that the dedication and discipline gained from it would make the police officer's job a lot easier. The urge to want to hurt someone, particularly one who victimizes the innocent and helpless, can be overwhelming. Ethics need to be adhered to by law enforcers, if for no other reason, because criminals tend to exploit the system the way they do.